What a fun trip down memory lane! Thanks for taking us along! Oh, those 80s!! Fun to look back and remember, isn't it? 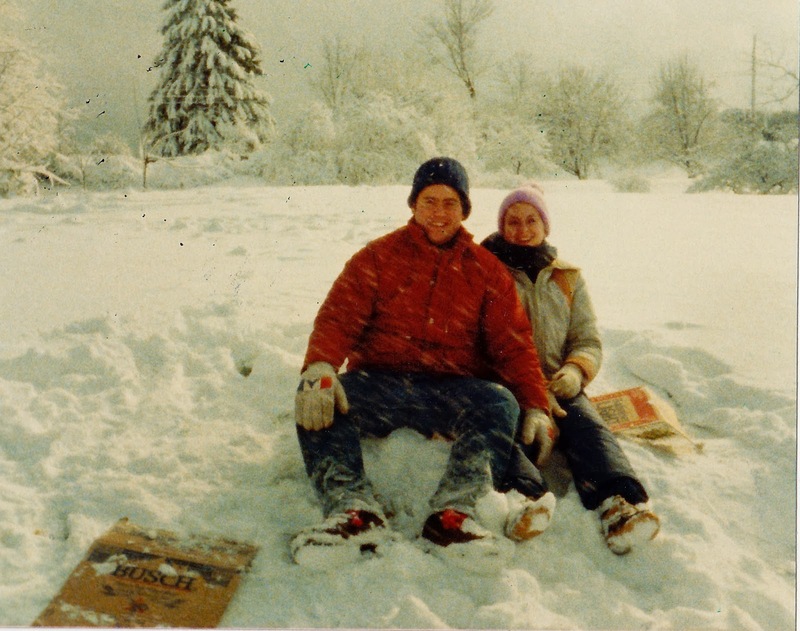 Hubby and I had our first "snow day" in 1973...4 months before we were married. We seldom get snow here in GA, but that Feb we got 17 inches...most ever! We built a snowman and made snow angels...a rare treat. Last week,we got a couple of inches...made me think of that Feb almost 41 years ago! That is SO funny about the moustache! I have only seen Honey without his a couple of times in the 32 years I have known him. He does NOT look like my husband without it, it's weird! I like the throwbacks, it's good to remember! Joyce, I just LOVE reading your blog and typically stay in the background....but couldnt resist commenting on this one. It was the picture of you and and your husband that did it! I am not sure how long you were dating at this point...but the way you arms are wrapped around him, brought me back to young love....to that feeling that being together was never long enough or close enough. That all you wanted to do was experience everything with THIS one person. Truly this is really a special picture, and I am glad you have all the details on the back of it- so someday when it is uncovered by your fruits of the family tree....they'll see it too. Thanks for sharing- it has aroused wistful memories for me, of a special time in life. I would not have put a hat on either! Your hair looks great with wings :) I love the ski jacket too. I laughed when I remembered how short they were and how everything hit right at the waist. Such fun memories! Ah, if only we knew back then what we know now. ha! 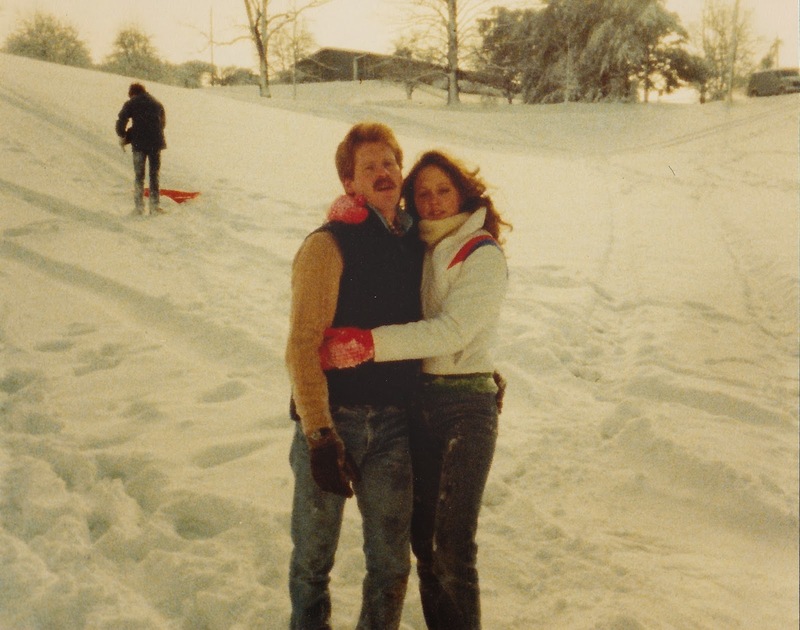 My hubby had a mustache when we met (1981) and would still have one today if I hadn't pushed him to shave it off. Whew - much better! I remember disc cameras - I had one, wonderful grainy quality of the pictures. I remember disc cameras. I think our first vacation as a couple were taken on one. I'll have to dig those photos out and compare the quality. We really thought we were high tech too. I love everything about that picture and this post! I can't believe I've never seen this picture before. p.s. You're hair looks fantastic, I wouldn't have worn a hat either. Sweet memories! You guys were so adorable! Always fun seeing pictures from the past and yes mustaches were definitely in! People use to laugh at me because I bought a date stamp and would put the date on the back of all of our pictures. Wayne and I have been married for nearly 19 years and although I have seen pictures of him without a mustache, he's had one ever since I've known him. That was fun! Such a cute couple you were. Love the story about the mustache. I'm with you on not wearing a hat - it was always scary when I had to take the thing off. Oh, love the mustache story. Hubby has had one for probably 35 years and he did shave it off once when the kids were little and they told him his face was crooked without it. It was hysterical! He immediately grew it back and has had one ever since. Enjoyed your Throwback Thursday entry!!! I love tbt....these are great! My hubby has a beard I can barely remember him without even though it was off and on in the last 25 years.....I had a disc camera loved it....I wish digital came about earlier all my early on pictures are fading! Have a wonderful weekend! When I saw "throwback Thursday" and then saw your "boyfriend" looking like he couldn't stand up without you, I thought he looks like he "threw back" one too many! Mouth hanging open...haha. Enjoyed the memories of milk crate bookcases and nothing matching your roommate's bedding and sharing one phone in the hall. Aaah. I remember having to stand in line with quarters to use the pay phone or call collect to my BF. Thanks for a good laugh and fun pictures. Love it! Thanks for pulling out your pictures and your memories and sharing them with us. The older we get, the more precious they become. I remember crying the first time my dad shaved his beard and mustache. He doesn't look like my Daddy without them. Disc cameras……ha…..haven't thought about those in a good while! Yes, February is not a good blogging month! I sat down tonight and had nothing!